Holistic and progressive SEO wins the race! 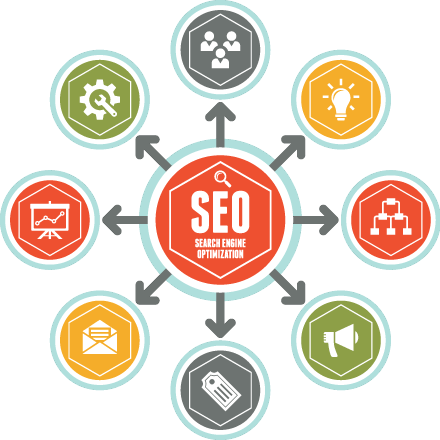 SEO incorporates many factors. Most important is to deliver relevant, accurate, and engaging information to the searcher and search engines. The concept of SEO is basic. However, the execution is complex and time consuming and in most instances a full time team member would be required to remain up to date with the industry and daily workload. Sectorlink’s SEO philosophy is to keep current with today’s best practices with an eye on the horizon. Our strategic SEO focuses on relevant audiences that align with your products or services for long term success. Leverage our bench of professional writers, content marketers, designers, developers and analysts to drive the right audience to your website. It begins with discovering key words that are relevant to your business and have adequate search volume. Volume is a critical factor, because if no one is searching for the word, no one will find your website. After an in depth review of your business and an industry analysis, we will be able to lay the ground work for the best SEO strategy. Work is concentrated on increasing organic traffic from key words that are not tied to local geographic terms. National head terms deal with higher search traffic volumes and are more competitive for ranking. With 90% of click traffic derived from the first page, it is critical to assess appropriate key words and their probability to rank. Our SEO analysts review your website and make recommendations that will optimize on-page technical requirements. Some recommendations include tile tags, meta descriptions, key word optimization, internal linking, rich snippet markup, index check, G+ Authorship, conversation optimization, canonicalization, 404 errors, robots.txt, site-map review and more. Work is concentrated on increasing organic traffic to key word searches that are associated with geographic locations and high profile directories. The same consideration is given to search traffic volumes and ranking probabilities when selecting local key word phrases. Get listed and found on Google, Bing, Yahoo, Yelp and the most popular directories. We create, complete, and continuously updated compelling profiles on the major directories. Profiles includes synchronizing business name, address, phone number adding key words and categories, verifying, monthly business updates, monthly content updates, special offers, videos, pictures, links to blogs and other published content. People seek engaging content that is informative and accurate. Our professional writers and designers produce original articles, videos, business quotes, press releases, and infographics that are to the point and will make your organization stand out as the industry expert. Fresh content is key to engaging your target audience and bringing them back for more. Our writing team creates compelling blog posts that are relevant to your business and industry. Dynamic blogs will bring your website to life with engaging information that will set you apart from the competition. We have the muscle to create memorable research based infographics with high impact. The infographics are usually 640 pixels wide so they are easily embedded into blog posts to encourage sharing. Our video analysts use investigation and fact finding research to bring your message alive through video. We have an extensive image library and use professional voice overs to create informative videos that are relevant and stand out. Our news desk is working hard to include your business in the traditional news cycle. We identify relevant publishers and work with them to include your research and facts into published reports. Ready to start something awesome? If you are looking for an integrated marketing strategy, a stand-alone digital solution, or you’re an online guru in need of extra support, Sectorlink has the digital experience that can be trusted.